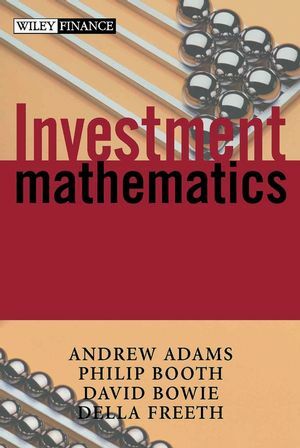 Investment Mathematics provides an introductory analysis of investments from a quantitative viewpoint, drawing together many of the tools and techniques required by investment professionals. Using these techniques, the authors provide simple analyses of a number of securities including fixed interest bonds, equities, index-linked bonds, foreign currency and derivatives. The book concludes with coverage of other applications, including modern portfolio theory, portfolio performance measurement and stochastic investment models. ANDREW ADAMS is Senior Lecturer in Finance and Director of the Centre for Financial Markets Research at the University of Edinburgh. He has studied financial markets for over thirty years, as a practitioner in the City of London and as an academic. His research interests focus mainly on investment trust pricing and risk. PHILIP BOOTH is Professor of Insurance and Risk Management at the Sir John Cass Business School, City of London and Editorial and Programme Director at the Institute of Economic Affairs. He is a former special adviser at the Bank of England and previously held the Chair in Real Estate Finance and Investment at the Sir John Cass Business School. He has a long experience of teaching and researching in the fields of investment and social insurance and is author or co-author of a number of books and papers in these fields. Philip Booth is a Fellow of the Institute of Actuaries and of the Royal Statistical Society. DAVID BOWIE is a Partner and head of quantitative analysis in the Investment Practice of Hymans Robertson Consultants & Actuaries. His focus is on the development and application of asset/liability modelling and the use of capital market theory in providing investment advice to pension funds and other institutional investors. DELLA FREETH is Reader in Education for Health Care Practice at St Bartholomew School of Nursing and Midwifery, City University, where she conducts quantitative and qualitative research. Part II Statistics for Investment. Estimating parameters and hypothesis testing. Measuring and testing comovements in returns. Modern portfolio theory and asset pricing. Student's t distribution: critical points. Areas in the right-hand tail of the normal distribution.